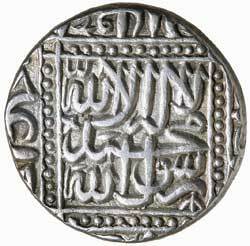 SULTANS OF GUJARAT, Shams al-din Muzaffar III, (A.H. 991-992, A.D. 1583-1584), silver rupee, Ahmadabad Dar al-Darb Mint, (11.38 g), A.H.991 (1583), (G&G G647). Nearly extremely fine and scarce. Ex Dr V.J.A. Flynn Collection and Baldwin's Auction Sale 53, 25 September 2007, (lot 1705). 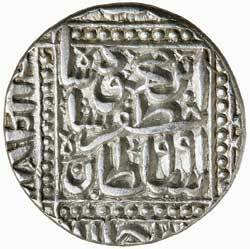 The Mughal invasions took place in 980, howevere Muzaffar III in 991 regained the throne for a short time where he stuck rupees in his name at Ahmadabad in a Mughal style. His position was soon reversed and new Mughal coins were struck by Akbar and his successors in Gujarat shortly afterwards.